Recently, I traveled through Southeast Asia for four months. As a marketing professional who automatically analyzes every message I see, it was all I could do not to be overwhelmed there. SE Asia is like the Internet come to life – overstimulation, selling and commercial offers everywhere. Instead of website popups, there are pop-up vendors. Instead of Google Ads, there’s a guy shouting at you on the street. Everyone’s an entrepreneur, and they all come out to the markets to hawk their wares. It wasn’t long before I began to pick up what separated the successful from the struggling restaurants, booths and roadside stands. These eight principles, when incorporated into your website or sales material, will make you as successful as the most popular street vendor on the block. I was approached countless times each day and offered everything from cab rides and hotels to food and tours. I quickly learned to tune out these offers. It was only the more bizarre or outstanding messages that caught my eye, and ultimately, won my business. If you’re doing what everyone else is doing in terms of messaging and marketing, you’re going to get what everyone else is getting. Don’t afraid to be different, even if it feels risky. It will pay off. Infuse some personality. Skip the corporate speak. Give people something to talk about and make their day a little more interesting. They’ll thank you for it. If there’s one thing Asian street vendors have down, it’s signage. Their signs may not always be spelled correctly. They may not make grammatical sense. But they do tell you what the business does in less than two seconds. It doesn’t matter that they aren’t perfect. They get the job done. Likewise, your potential customers should be able to understand what you do within two seconds of getting to your website or seeing your promotional material. Revisit your website, your sales page, your direct mail piece or your brochure. Does your prospect understand what you can do for them in two seconds or less? If not, rewrite your copy using clear, easy-to-understand headlines. I don’t think I have to tell you which option won. 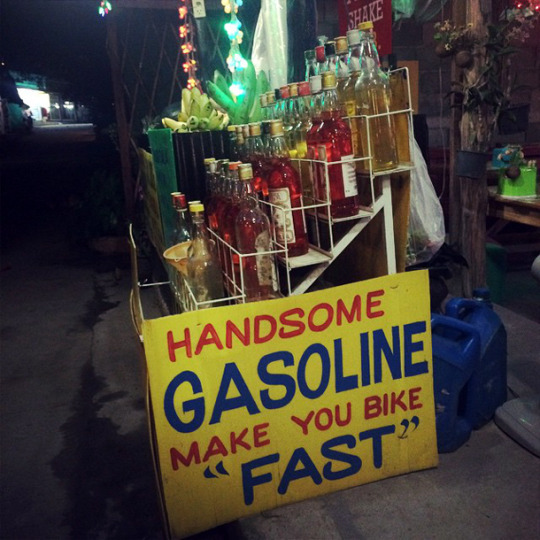 I don’t know if the handsome gasoline actually made me go faster, but I immediately understood that there was an added benefit to choosing this particular provider. Are you giving your customer a reason to buy from you in your headline, or are you making it all about yourself? Your headlines should contain clear benefits for the customer. If the main headline on your business webpage is “About XYZ Company,” you’re doing it wrong. Tell the customer what you can do for them, and it’s going to lead to a lot more engagement, and ultimately, higher sales and happier customers. In Phuket, pickup trucks would cruise down the street, blaring promotional information from a loudspeaker about the Muay Thai fights taking place that night. Was it annoying? Yes. Did I wish they would go away and never come back? Yes. But I knew when and where the fights were happening as a result. Awareness is essential for anyone to become a paying customer. Street markets are ubiquitous in Thailand. Whether it’s the local evening food market or the Chatuchak weekend market in Bangkok, there's no shortage of markets to attend. You can find anything from food and clothing to live animals, oil paintings and furniture. The point is, these vendors know that people who are ready and able to buy are going to be shopping at these markets, so they take the necessary effort to bring their business to where they know the customers will be. You can use this same principle in your own business – online and off. Are you using the large platforms online? If you’re an e-commerce company, do you sell on Amazon, the largest online retailer in North America? If you sell digital magazines, do you offer an iPad version? You can take advantage of this offline too. Advertise in the publications your audience is already reading. Become a thought leader in your industry. Attend trade shows where you know you’ll find your ideal customer. I always tell my clients, “Don’t make it hard to do business with you. Your customer isn’t going to put in the work to find you – that’s on you."